Once again the master artisans at Graff Diamonds marry complex watchmaking with elaborate diamond setting and enamel work in this beautiful MasterGraff Floral Tourbillon. The 36mm 18K white gold watch features a dial adorned with enamel-painted flowers that rotate on themselves via a complex series of gears and wheels. The enamel process for the unique blooms is time consuming, and a single dial can take up to 50 hours to complete. 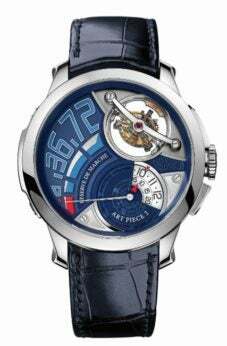 The movement displays a tourbillon with floral motif at 5 o’clock, and offers hours, minutes and animated flowers at 8 o’clock, 9 o’clock and 12 o’clock. It is offered in a Tahitian blue dial or an orange/pink mother-of-pearl version.